Member Events | Junior League of Tucson, Inc.
Our main focus at the Junior League of Tucson is to promote voluntarism, develop the potential of women, and improve communities through the effective action and leadership of trained volunteers… and we like to have fun while doing so! Each summer, we recruit new members to join us for this journey. Are you curious or interested in joining? Please join us for an informative session or see our Facebook Page for more details. JLT University: During JLT University we had a guest speaker come and talk to our members on Adoption and the process one has to go through in order to adopt. Also, during this training we learned about self defense and relaxing techniques using yoga. Kendra Scott Gives Back: Collaborative jewelry event that allowed Member Events to support and play with the Fund Development Committee and members, sipping cocktails, perusing gorgeous crystal eye candy jewels, while supporting a local charitable organization. Meet Me At Maynard’s: A social get together for members to meet new members! Soul Sistas Hike: Each Spring we gather together to hike our beautiful surroundings! Nothing is better than exercise, beautiful scenery and friends! Yoga with Cats: A new type of yoga to relieve anxiety! Holiday Hubbub: A weekend of Merry Making with Creative Tribe: An organized group gathering to create crafts! Sustainer Tea: Board Members are invited to get together to celebrate another successful year in the JLT! Holiday Soiree: A member get together to celebrate the holiday season! 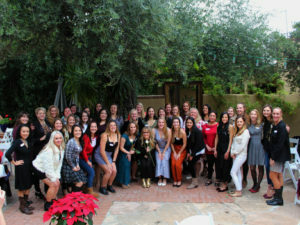 The new year sparks a “Happy and Healthy 2019” program to provide more opportunities to get involved and experience why being a part of the Junior League of Tucson organization is truly fun and worthwhile!